I love to collect Depression glass. Growing up, my grandmother had lots of it, pink, green, and clear, in many patterns—some complete sets and other odds and ends pieces. A few years back, she decided she didn’t have room for it any more and gave all the green glass to my uncle and all of the pink and clear to my aunt. She gave me most of her blue Currier & Ives Transferware (that I’ve yet to take home, every time I’m over there she bugs me to take it home!) In this post, I will address Depression glass topics including a brief history, description, how to spot a reproduction, and care. I hope you find this information useful and please let me know of other items I may be able to give a background on. 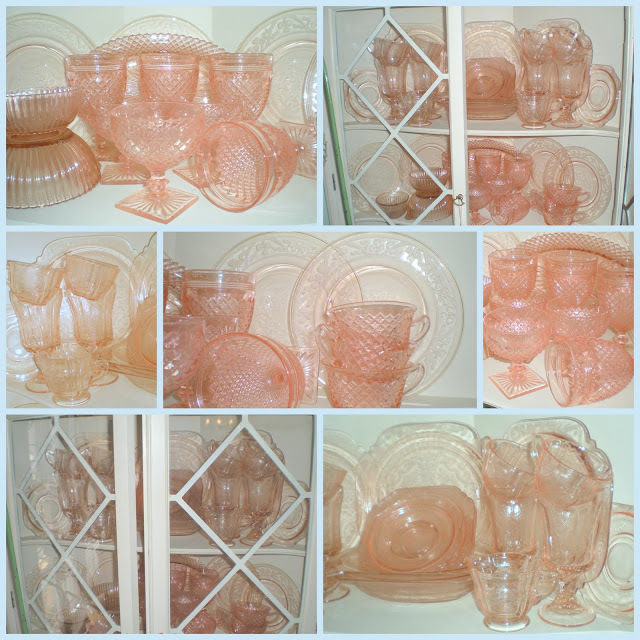 The photos in this post are of my collection of Pink Depression Glass. I’ve gleaned information from my experience in the antiques trade and from other collectors and dealers to give a brief lesson on Depression glass; incase you are not familiar with it or would like to know more. I encountered many colors and patters of Depression glass over the years I ran an Antiques mall. Okay, I know we’ve all heard the term “Depression glass” or seen it in a shop or at auction—but what makes it Depression Glass and why is it so special? Depression glass gets its name from the time it was produced—The Great Depression. Production of Depression glass was primarily from the late 1920’s to the early 1940’s. This was the main production period—the “first-run” if you will. After this period, some companies produced some popular patterns of variations thereof well into the late 1980’s. I consider this “second-run”. Many glass companies sold out to larger companies or went out of business and reopened under different names soon thereafter. These changes led to hundreds of patterns and sometimes several variations of patterns in many colors—amber, pale blue, clear or crystal, green, pink, red, and yellow or canary. Other less common and therefore more collectible colors are Jadeite (an opaque mint green), ultra marine, Delphite (an opaque baby blue), Ruby red, amethyst, black, white (milk glass) and cobalt. Basically, Depression glass is mass produced cheap glass. Because of the many companies that produced it and the mass quantities in which it was originally made there is much of it to go around. Because of the state of the economy during the time of production, Depression glass was frequently given away by companies as an incentive to buy their product. Movie theatres gave it away with ticket purchases. Get gas and when you buy so many gallons of gas—get a set of dishes. Manufactures of dry goods, including Quaker Oats, included a piece of glass in the box with soap powder, dry cereals, and other food—just imagine the ruckus the FDA would raise if Quaker started doing this again! Eek Recall—glass in the oatmeal! Depression glass was also available in retail shops for a very low cost—mostly local Five and Dimes. Because of unscrupulous antiques dealers, reproduction Depression glass has entered the marketplace. There are those that buy reproductions wholesale in mass quantities, and sometimes sell directly to collectors either in an antiques mall or online eShops. Some go as far to travel around selling their wares to other dealers telling them that it is authentic, and other dealers unknowing sell reproduction glass as genuine. Now, don’t get me wrong, sometimes a reproduction piece can finish out your set and save you hundreds of dollars in some cases; however, some dealers sell reproduction as new. I’ve seen dealers take a reproduction piece out of the packing and rub the bottom across a dirty concrete floor to make it appear old! I’d hate to pay genuine prices for reproduction items. I want to let you know how to spot a fake—for starters, reproduction Depression glass is often times a much higher quality glass—yes you read that right! Because of modern mass-production techniques, the end result glass is of higher quality. However, the patterns are often much more crudely done. Instead of the original finely detailed flowers there is what looks like a child’s drawing of a flower in its place. It is easiest to tell a reproduction from an authentic piece by holding them side by side. So if you do collect a specific color and pattern, carry a piece with you when you are on the hunt—not only will it help the staff at your local antiques shop know if they have any, it lets you do a side-by-side comparison of what is real and what is fake. Another way to identify reproduction Depression glass is by touch. Most reproduction glass has a slippery almost wet or greasy feel to it where genuine glass does not. Genuine Depression glass will vary slightly in color due to different production lots. Reproduction glass is frequenly a hair bigger or smaller than the original--up to a quarter inch due to different techniques of producing the mold. If you suspect a piece is a repro, measure it against a piece you know is authentic. There is also a whole separate category of reproduction Depression glass—Fantasy glass. Fantasy Depression glass isn’t exactly reproduction because they are pieces that were never made. Fantasy glass is a new piece produced in an existing pattern. The details of pattern are faithfully reproduced to be as close to the original as possible. They were created to fill out sets and provide serving pieces to collectors. Many times whole sets of dishes were never created in the same pattern nor were serving pieces, cake plates, etc. produced. This is where Fantasy glass comes into play—it lets you buy water glasses in your pattern, even though your pattern never had water glasses. I have a few pieces of Fantasy glass. Depression glass is made to be used—if you decide to use your collection—please remember it is delicate. Do not put it in the dishwasher—the high heat can discolor or warp the glass. It will also etch the surface and make it appear dull or cloudy. Never rapidly change the temperature of the glass. It is not tempered so it can crack easily due to extreme temperature changes. Do not microwave it. To prevent glasses from cracking, always pre-heat teacups by pouring hot (not boiling hot) water in and letting it sit for a few seconds and dump it out before adding boiling hot coffee or tea. Do not let coffee or tea sit or dry in lighter colored glass as it could discolor. Hand-wash it in warm soapy water. Let air dry. To prevent scratches to surfaces, stack a coffee filter between pieces when storing. Other, higher quality, glass produced by companies such as Westmorland, Fenton, and Heisey in this period and sold in department and jewelry stores are know as Elegant Glass. Elegant glass was a common alternative for fine china from the 1920’s to the 1950’s when cheap Chinese and Japanese imports began to flood the market. Elegant glass of this era is much more valuable than Depression glass of the same era. Even so, glassware—Depression, Elegant, and Dime Store glass from the 1920’s – 1960’s is highly collectible. Swanky Swigs, Pyrex, FireKing, Anchor-Hocking, at others are popular collectible brands of this era. Here are a few more photos of my collection. I have various patterns in pink and clear, with only pink shown in this post. You can see the varaitions in color in just pink--so just imagine the variety of colors out there! Some pistachio ice cream would look so cute in these pink sherbet dishes! There is so much more blog to see! Please click on newer posts or older posts to view the rest of my blog. If you haven't become a follower yet, I'd love to have you join me! I wouldn't want you to miss anything! 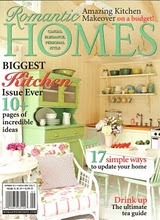 Oh--if you haven't noticed, my domain is now http://www.shabbyfrenchcottage.com/! Please update your bookmarks, if necessary! My old blogger address will continue to forward you to the new domain! Look for my eStore opening soon.